So, I know it’s still summer and we’re hot & sweaty everywhere, but…I wanted soup, so I made soup. 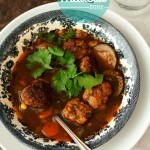 I was perusing through Saveur’s Mexico issue and it just had me craving soup and Mexican flavors. Sometimes, I just have to do what feels right and sometimes what feels right is piping hot and spicy soup in August. 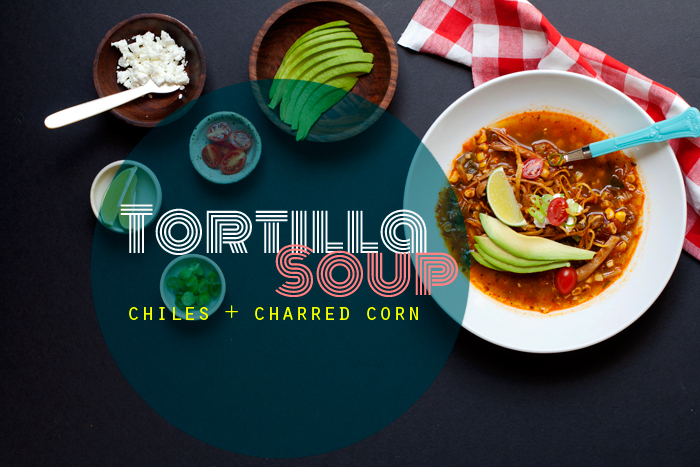 I think it’s fair to say many of us have had some variety of tortilla soup at one point or another…and, I bet some have been “meh” and some have been great. I happen to love tortilla soup because of all the garnishes–avocado, green onion, queso, tomatoes, crispy tortilla strips…mmm, yes. The soup itself blends the flavors of 4 chiles with chicken and charred corn–it’s broth-y and flavorful with bits of chicken, corn, and chiles speckled throughout. I’m sure if you’re not in the mood for soup now, in a few months you may be and I urge you to try this recipe. The chiles in the soup don’t immediately assault your taste buds, but leave that slow burn in the back of your throat. It’s the type that builds with each spoonful, delicious and lasting. When I make soups I just kind of go all in and wing it. I wrote down my ratios (for once), but just know that you can swap and change ingredients as desired–for both the soup and garnishes. Make it vegetarian, add other vegetables, use a different chile, go nuts…it’s your dinner! Note: I used the rendered chicken fat to cook the vegetables, you can use olive oil or other desired cooking oil if you’re not feeling the chicken. Garnishes: Avocado, tomato, green onions, queso fresco, lime wedges–pretty much anything you like. In a large pot (I used an enameled dutch oven) over medium-high heat, sear chicken thighs skin side down until crisp and golden and most of the fat has rendered into the pot. 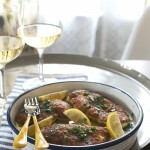 Remove chicken to a plate, and pour off all but 2 teaspoons of the chicken grease. Discard or save remaining grease. Over a gas burner, on the grill, or under a broiler, char the ears of corn. Remove from heat source and set aside to cool. Line a plate with paper towels. In a small skillet, heat about 1/4 inch of oil and fry tortilla strips in batches, draining on paper towels. Sprinkle lightly with salt while still warm. Set aside. Cook the onions, celery, poblanos, and jalapenos in the pan with the chicken fat over medium-high until the edges of the vegetables take on some deep golden color and begin to soften. Add the ground, dried chiles, cumin, and the chipotle plus adobo. Add 4 cups of chicken stock, water, and tomatoes plus juice to the pot. Return the chicken thighs to the pot. Tie the cilantro sprig into a knot and add to the pot. Bring the soup to a boil, lower to a simmer and cook 20-25 minutes, until the chicken is done. Remove the chicken to a clean plate and cool enough to handle. Taste the broth and add salt if desired. While the chicken cools, cut the corn off the ears–there will be corn shrapnel, beware. Shred the cooled chicken, discard skin, and add both the chicken and corn to the pot. Remove the cilantro knot, squeeze a whole lime into the soup and return the soup to a simmer–cook for 10 additional minutes. 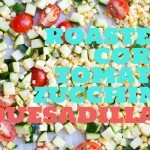 Serve with crispy tortilla strips and desired garnishes. Whoa. 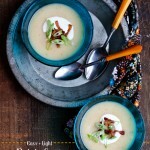 I want this soup right now! Love a soup with plenty of garnish. And I love anything with avocado. I’m totally going to be making this one. yes! I bet you’ll love it! Garnish buddies 4 lyfe! Oh man yesss. I’ve been on this weird summer soup kick, and I just found where to get dried and fresh peppers in Paris! Hoorah! whoa, that’s an amazing find! This looks great, like it came straight from a restaurant kitchen! I have also been craving soup lately. i totally made chili the other day because i was craving it…you would have thought i sprouted antlers the way my hubby looked at me! 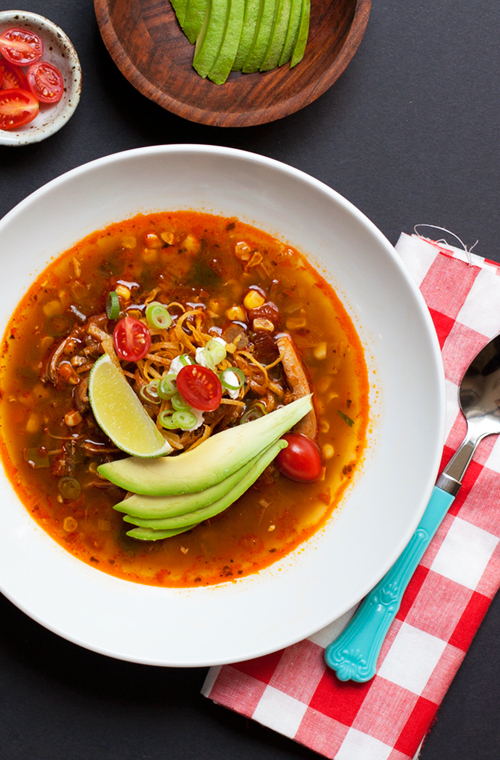 You’re totally right: tortilla soup can be soo hit or miss! This sounds great. Tortilla soup–I love it! I never make it at home, though, for some reason. Clearly that has to change! 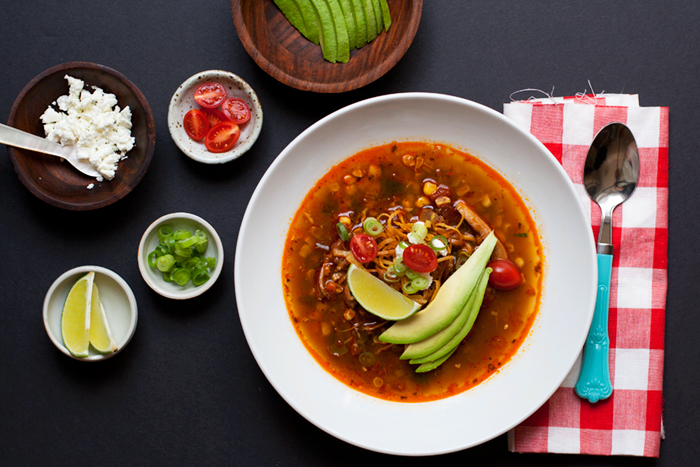 Ooo, I love tortilla soup – and this one looks incredible. Those garnishes are fantastic! 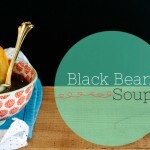 Gorgeous soup! 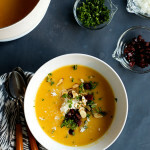 Love the sound of this spicy and flavorful soup. Garnish is the fun part for sure!